To assess the benefits of e-student card based on international payment cards Visa from Oschadbank can already more than 12 thousand. Students all over Ukraine. Hence, its users are already students of the leading educational institutions such as the Kiev National Economic University named after Vadym Hetman, Ternopil State Medical University named after IY Gorbachev, Cherkasy National University named after Bogdan Khmelnitsky, Donetsk Training Technical University, National University “Ostroh Academy” and others. 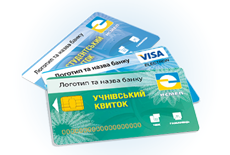 Electronic student ticket from Oschadbank – multifunction card product based on Visa Electron. It combines the possibility of bank payment cards and personal identification documents. The ticket is a complete payment instrument: students can be calculate with the help of trade and service network and the Internet, receive remittances, to replenish the bank’s own funds, to pay for goods and services, withdraw cash from ATMs worldwide. Cashless payments Sberbank payment cards carried out without commissions. In addition, the bank provides the ability to connect to modern remote service channels – SMS-informing, Web-Banking, Mobile-Banking. Maps produced its own processing center Oschadbank provides reliable protection of personal data of their users and the security of payments and settlements.